Many people ask us how much does it cost to get divorced? How much does it cost to mediate your divorce agreement? Whatever method you select to process your divorce, it is not an inexpensive proposition. The more you know about your finances, the less conflict between you and your spouse, and the more forthright you are with yourself and your mediator, the less expensive it is likely to be. 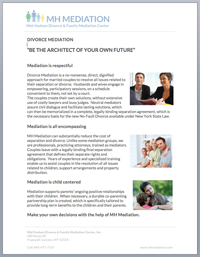 Using mediation is a major advantage when you are trying to keep the cost of divorce under control. Kathryn Lazar, Brett Jones and Elizabeth Shequine, mediators in our group, work with both members of a couple to assist them in coming up with their final agreement. The fee policy is set as follows: $250 Consultation, $350 Administrative Fee for all cases at the outset, and $350 per hour for each hour of service. Once agreement is reached, there is a $750.00 charge to draft the agreement and get it signed. The average couple spends between $2,500 – $5,000 in mediation, with the vast majority spending about $3,000 all told to finalize their agreement. In addition to that cost, you have to process the divorce, which you can do yourself (see below), or you can pay someone to do. Mediators are not permitted to both assist as a neutral in drawing up the final agreement and then also process the divorce, so we are restricted to helping people reach the final agreement. However, most of the money people spend to get divorced is spent to reach agreement, so the bulk of the expense is usually significantly reduced by using mediation to achieve agreement. Assuming a couple uses mediation to reach agreement and hires a lawyer just to process the divorce paperwork, we find that most couples spend under $5,000 to complete all aspects of their divorce. Can you do the divorce paperwork yourself? The New York Court system has generated an online service to assist parties in doing the necessary paperwork to get divorced — BUT it only works if you have no children under the age of 21. If you are in that situation, and you are able to fill out the papers on line using their program, the costs would be the approximately $350.00 filing fees. Doing the divorce papers on your own on line is similar to preparing your own tax returns — it is possible, but not that easy. You might prefer to have a law office prepare them for you to be sure it is done correctly. To see the forms the Courts have published, see www.nycourts.gov, and then click on “Do It Yourself – DIY”, and then click on “Uncontested Divorce”. What do lawyers charge to convert the agreement into a divorce? Each law office sets its own rates — the filing fees are always around $350.00; lawyers charge anywhere between $750 – $2000 to do the paperwork. If you also need a court order to divide up pensions, IRAs, 401ks or other retirement assets, there will be an additional charge, depending on the particular asset.